I was shopping on line a few months back and stumbled upon a "new to me" brand called Mode Cosmetics. They carry a range of cosmetics including eye, lip, nail, skin care, face and beauty tools in addition to their nail polish. Based in New York City and reasonably priced ($3.50 for each polish), I thought I'd order four polishes from their Glitter range. The swatch circles on their site are a little bit off, but now I know! These polishes all have a nice formula, but I didn't care too much for the frosty base on some of them. I used 2 coats on these and found that they applied well and dried in a reasonable amount of time. The bottle size is the standard 0.5 fl. oz. 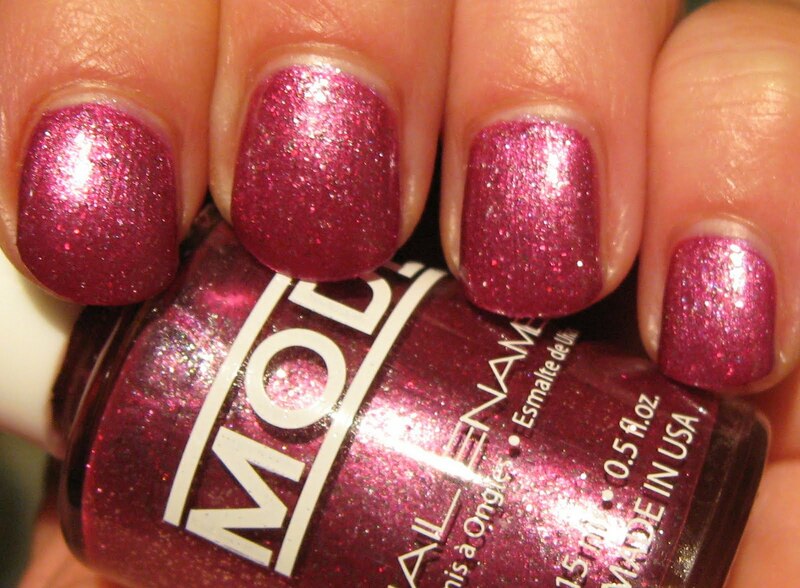 Above & Below: Mode is one of those companies that chooses to number their polishes rather than name them (boo to that! ), and this is #168. I would call this a medium cranberry frost that leans more purple in brighter lighting (above). It's filled with tiny multi colored glitter. 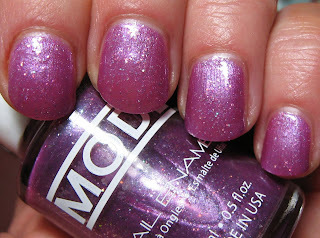 Above & Below: #169 is a lighter violet frost with tiny multi colored glitter, although the silver glitter seems to be more abundant. Above & Below: #157 is too frosty for my preference, while the first two above are probably within my "acceptable" range of frost. 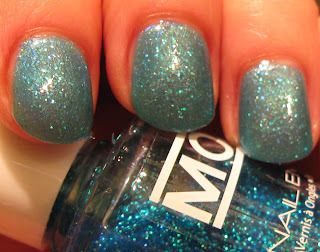 This is a pale ice blue with tiny silver glitter. Below: #166 is a completely different formula--it's got a base that's basically a light tinted blue, almost clear with foil glitter. The base reminds me of the old Maybelline Waters polishes, and it's really too sheer to wear on its own. This is two coats over the "too frosty" #157 above. I do think this is a rather unique formula though, and it would likely works beautifully over some darker shades as a glitter top coat. Below: This shows you what it look like alone, using three coats. It reminds me of blue glass--very sheer, but glossy and pretty. 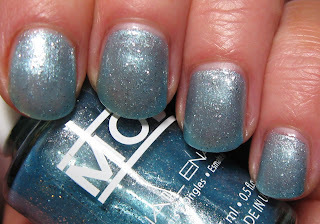 I was surprised and intrigued by the different colors of glitter in this shade, because in the bottle it looks like it contains straight turquoise glitter. 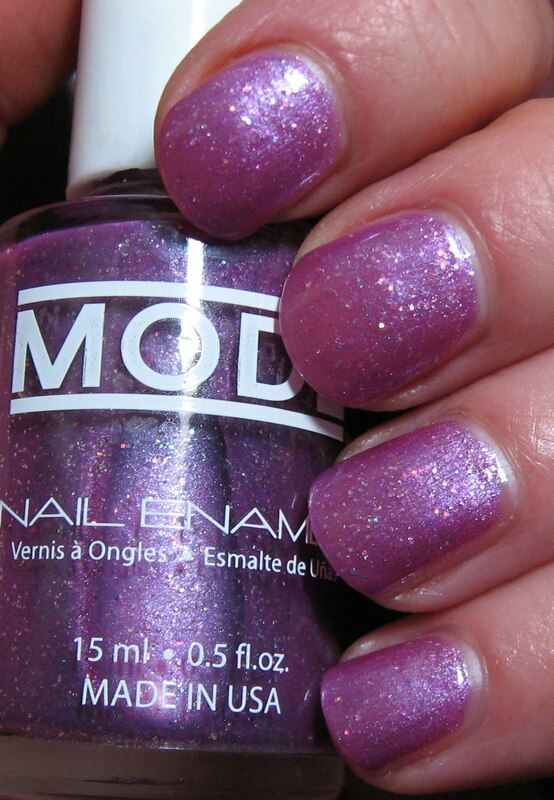 The glitter doesn't necessarily appear to be iridescent, but it definitely shifts colors quite dramatically. I don't think I made the best color selections, but I am happy with the quality of these polishes and the pricing. They have several other finish ranges in addition to the Glitters, so it's quite possible I'll order some more of this brand in the future to see what their other finishes are all about. 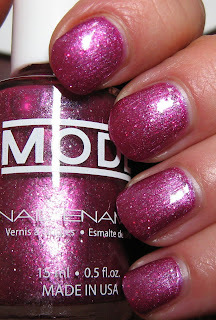 Have you ever tried Mode Cosmetics?